When you are on the go, sometimes having the multimedia connectivity you want isn’t always available to you. When I travel, I like to bring my laptop with me wherever I go and there is nothing better than sitting in a hotel room late at night with my laptop hooked up to their TV watching the movies I bring with me. There has also been plenty of times when I tried to sync three different videos running to three different TV’s for a presentation booth. Unfortunately, my work laptop does not have an HDMI port built-in, and I hate traveling with more than one laptop. 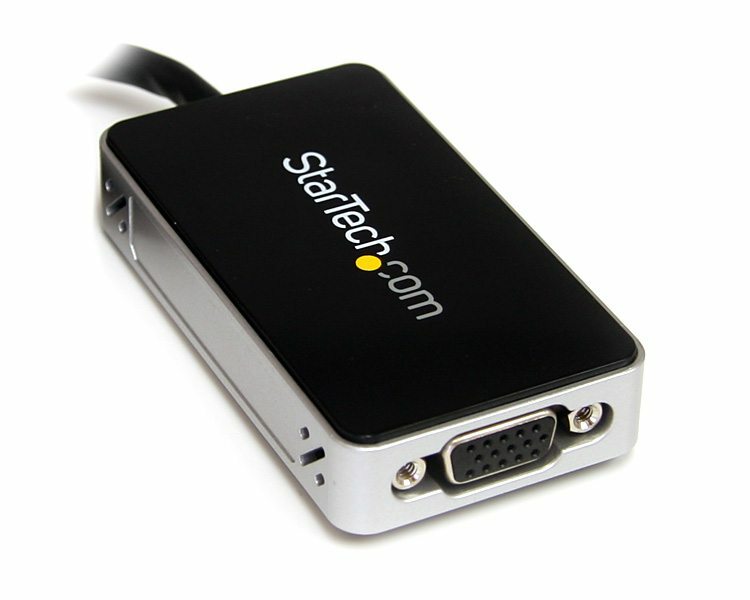 Luckily, StarTech has a solution that they think can give me the ability to travel light and connect my work laptop to any to type of monitor/TV. 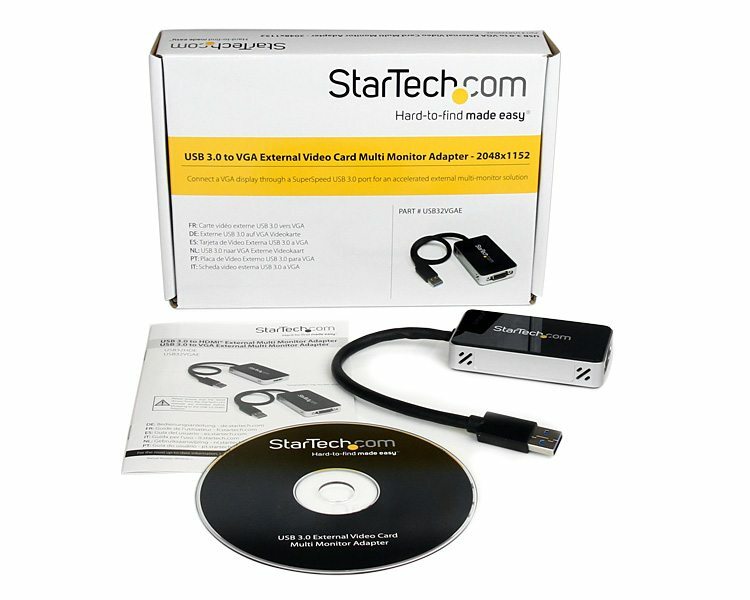 StarTech has created two different types of adapters for people like me: the USB 3.0 to HDMI External Video Card Multi Monitor Adapter (USB32HDE) and the USB 3.0 to VGA External Video Card Multi Monitor Adapter (USB32VGAE). The USB32HDE is capable of delivering 1080p video through USB 3.0 to a TV, monitor, projector, or whatever else and also comes with a DVI adapter to accommodate HD content when a HDMI port isn’t available. With the USB32HDE installed, you are able to either extend your desktop across the adapter or mirror your desktop to deliver content to multiple displays simultaneously. For multimedia, the ability to display HD content through an adapter makes entertainment easy and delivering a presentation a snap. 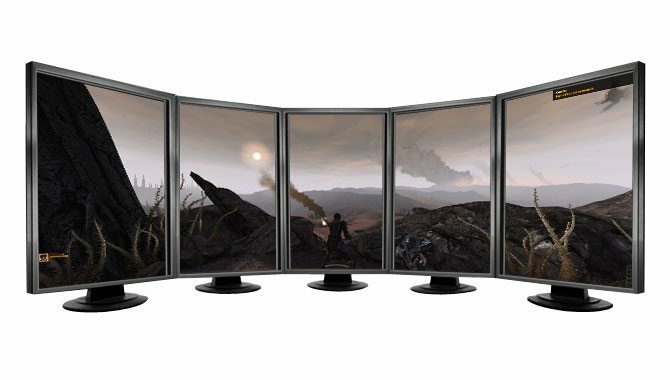 If you want to get really slick, there is the capability of running up to 5 of these on one system allowing you to display HD content to multiple monitors/TV’s simultaneously! You can even extend your desktop across five big screens to eliminate the need for running multiple systems to drive multiple displays. The software behind the USB32HDE also supports display rotation. Having a well defined driver gives you the option of landscape or portrait displays for any purpose. Although the USB32HDE mainly differs in its video port, there are some subtle things that are worth mentioning. First, you don’t have the ability to run five of these from one system (I don’t have more than one to test, and StarTech’s page for the item doesn’t say you can). The other main difference is its resolution capabilities, the USB32HDE can display resolutions up to 2048×1152 as compared to 1920×1200 for the HDMI sibling. Then the similarities start to kick in again as both still operate off of USB 3.0 and maintain USB 2.0 backwards compatibility, both are still self powered, and both feature the same well developed drivers and all the display options. The HDMI version of the adapter seems to be the best buy out of the two as it provides the most flexibility. However, if you are a desktop guy and need a quick and easy way to add that old VGA display without having to open up your computer to install a dual head video card, then you may find a use for the USB32HDE. When it comes to my uses, the USB32HDE comes with me everywhere. Having the ability to connect my laptop to multiple displays has really made running a presentation smooth while having the ability to run them on five monitors at once from one laptop instead of five laptops. Don’t get to giddy about turning a cheap PC into a gaming rig with one of these. The video processing is capable of handling HD video, but that is about all. The installation is as easy as pie. Connect it to USB, install the drivers, then configure them as you would any other display adapter. This means that even my father (age 63) can mange the installation without having to call me four times. The flexibility that you gain with the HDMI version of the adapter allows you to convert one PC / Laptop into a multimedia machine or presentation godsend. With a size of 78mm x 15mm x 43.5mm, they are extremely portable. Bottom line, if you are on the go, or don’t feel like ripping apart your PC, then you really just can’t go wrong. 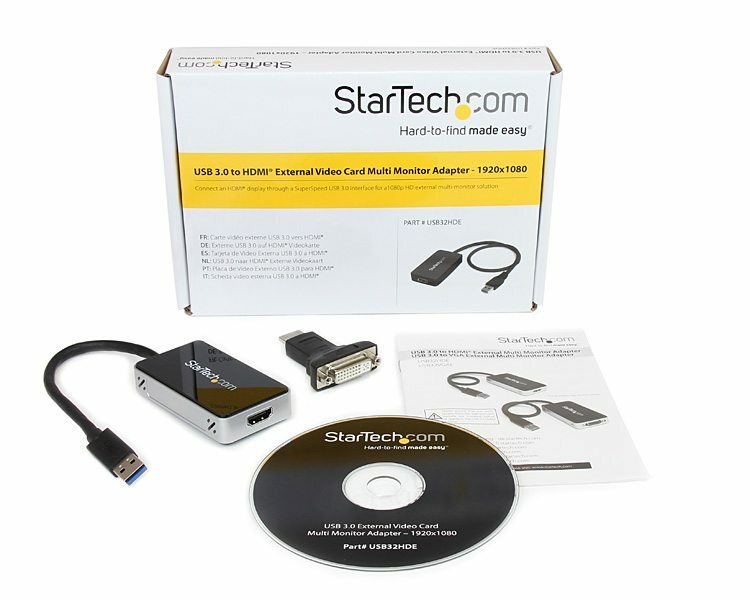 At a 117.99, the USB32HDE is a no brainer… If you do trade shows, want to convert a standard machine into an HTPC, or want to be able to connect to any display at any time, StarTech has produced a must have product. Bottom line… would I buy one? The USB32HDE… yes. The USB32VGAE… probably not, as most machines have a VGA port already and/or most newer monitors don’t.